Casa Vista Azul is an authentic handcrafted tropical villa. The interior of the home is as spectacular as the Pacific Ocean views and the rainforest flora and fauna that surround this 7 bedrooms 7.5 bath villa. It is a Balinese designed villa open to nature, yet provides every well-appointed comfort. It is the perfect location within Manuel Antonio for local markets, restaurants, spas, and all Costa Rican beach and rainforest adventures. Please note: This villa is available to be rented as a 5-7 bedrooms with varying rates respectively. You may find other ads for this home with different rates for different bedroom counts but it is always private to just your group. Please inquire about specific rates for smaller or larger groups. Casa Vista Azul is a traditional 4 floor Balinese villa with a 2 level pool house, custom designed furnishings using exotic hardwoods and original ceramics. Every detail of this villa exudes peace and tranquility, providing a place to enjoy quality moments with loved ones as well as personal contemplative space for yoga and reading. The pool area is truly an oasis with waterfall and beautiful gardens. The pool has a lap swim area and a shallow area for young children with plenty of shade and a sundeck. 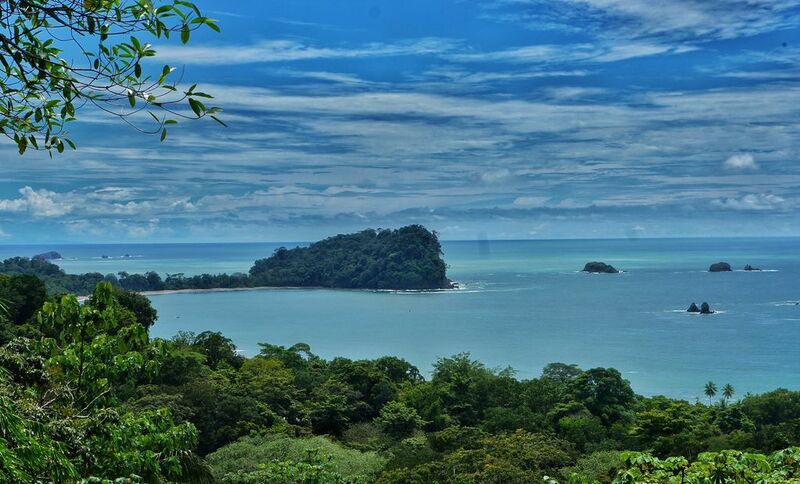 The top 3 levels of the villa have sweeping views of the Manuel Antonio National Park and the Pacific Ocean. Pacific Canyon Drive is a private gated neighborhood set-off the main Manuel Antonio road. It is a community built by expats that wanted the comforts of modern luxury living within a tropical beach town. All conveniences and necessities are available by bus, taxi or walking distance. Since 2001 ESCAPE VILLAS has been the premier source of vacation rentals in Costa Rica. With offices in Manuel Antonio, we take pride in providing professional management of only the best vacation villas in the country. ESCAPE VILLAS offers the perfect venues for your COSTA RICA beach wedding or family reunion. We have a selection of luxury tropical villas for you to choose to accommodate any number of guests, all with spectacular ocean views and easy access. We also have expert dedicated concierge service that will help you coordinate all the details for your dream vacation. At a 5 minute drive or 25-30 minute walk/hike to the beach. Very hilly terrain, not for the very young or the elderly. Walking distance to plenty of restaurants and shopping along the main road. The host will provide a local cell phone for your convenience. All bedrooms are air conditioned. The entire house is cooled by ceiling fans and tropical breezes. Personal guest laundry services provided once a week, additional laundry services available for a small fee. Has 3 stops, the top main living level, the master suite level, and the ground/pool level. Chef services included for 2 meals a day, cost of food is addiitonal. Ask us about our meal plans that include the food and drinks. Tropical gardens surround the home. There are tennis courts in the area, ask your host for details. There is a full 18-hole golf course at a 1 hour drive. Ask you host for details. Only a few wide and shallow steps from parking to main living area with elevator. Elevator, Huge Terrycloth Bathrobes, 100% Cotton Linens (350 count), Magnificent Views, Terraces, Tropical Gardens, Daily Housekeeper, Gardener, Personal Guide to the Area, Concierge, Washer, Dryer, In-Room Safes, Chef services included for 2 meals a day; Cost of food is additional. wonderful!! I loved everything about it!! The staff was EXTRAORDINARY...Everyone went out of their way to help us enjoy this vacation to the max. All of us, including our 7 and 14 y/o loved the experience and will always remember this amazing vacation...Thank you for this wonderful experience!! This is an amazing house, and our group of 14 had a fantastic time. Carmen took beautiful care of everything, Esteban cooked us delicious meals every day. And before we even arrived, Valerie was incredible in organizing our transportation and activities. Not an easy task with so many people, and we had last minute changes that she helped us figure out. We couldn't have done it without her. The house looks just like the pictures - though even better. Monkeys visited several times during our week stay, which was incredible for us. We spent much time in the pool and the upstairs living area. There was plenty of room and seating for everyone. Beds and linens were lovely. I will say that this doesn't seem like a good property for small children (though they had a high chair), with it's many steep stairs. And for us (maybe it was the heat? ), the walk up to the restaurants and stores was a killer. We only did it once, and we were soaked in sweat. So we relied on taxis and busses to get us around. And groceries get delivered quickly from any of the nearby stores. I will forever miss the view! Thanks for an amazing week. Thank you for the great review and the kind words about the hard working staff. Manuel Antonio is hilly and true rain forest jungle, beautiful and humid but still paradise. Casa Vista Azul was the perfect hideaway! Casa Vista Azul was the perfect home for our big family vacation! Spacious, clean, and with the best open living room area with a gorgeous view of the ocean in the distance. Both Fernando & Valerie were easy to reach prior to our trip, and provided all the info we needed before getting there. And we can’t forget our concierge, Ricky. He was awesome and only a phone call away if we had any questions. Chef Esteban & Carlos we’re also AMAZING, and cooked for us every morning and night, and never disappointed. The house location is super convenient, and there’s plenty to do/eat close by. We spent an amazing week in your home and would love to visit Manuel Antonio again soon, maybe with more family. :) Thank you for having us! Hello, Valerie, it was simply wonderful to have your big family stay with us at the Casa Vista Azul. It seemed they all had a blast and we always love to host large families. We look forward to the day when you come back to visit. Thank you anf Pura Vida from everyone at Escape Villas Costa Rica! Memorable vacation at Casa Vista Azul ! Oh what a wonderful experience it was to stay at Casa Vista Azul! Everyone at Escape Villas made our stay very special. From Ricky the host who in his fun, boisterous way was attentive to every detail. He checked on us all the time. Filled us in on all we needed to know. And got us last minute reservations when we asked. To our chef Esteban who cooked amazing meals . He is the Best. To the cleaning staff who kept everything neat and organized. The house is lovely. Set among the jungle. Charming furnishings. Lush vegetation. Great views of the ocean. And monkeys visiting at leisure :) How can you ask for anything more !!! We were 12 people with different interests. The house was big so we were not on top of each other. Everyone did their own thing during the day and then we would gather around the huge dining table to enjoy togetherness and share delicious meals. Manuel Antonio is a great area for vacationing. Right in the middle of a huge National Park. It is quiet. And it is gorgeous. And the people of Costa Rica are so nice and gracious. Thank you for the wonderful review of your stay at Casa Vista Azul. Escape Villas enjoyed having your great group stay with us at this luxury villa. Our entire staff appreciates your kind words and knowing their efforts satisfied another guest keeps us motivated to be the best! Please come back again to our paradise! Casa Vista Azul exceeded our expectations. We traveled as a group of 12 and there was plenty of room for everyone. The ocean views were majestic, and we loved the daily visits from the local monkeys. The location of the house offered easy access to town, excursions, and beaches. We can't say enough about how amazing Chef Esteban was. He prepared breakfast and dinner for us daily, and the food was incredible! We opted for an all inclusive meal/beverage plan and would highly recommend to any large groups traveling together. Definitely don't leave without trying Esteban's arroz con pollo! Overall, we had a great experience and would absolutely return. HIGHLY recommend! Amazing family vacation at Casa Vista Azul! We recently took a family vacation to Costa Rica and stayed at Casa Vista Azul. We were initially worried about committing such a large dollar amount from a distance, but Fernando and Valerie eased our concerns and helped make the booking simple. Valerie was also very useful helping arrange for car to and from the airport, and for activities when we were there. We had children under 10, and seniors over 80 (8 guests total). In terms of the house, it was much better than the pictures and exceeded our expectations! The beach was a short drive, and groceries were super close. Having a car available/rented was a plus. The rooms were spacious and clean, and the view was wonderful. Having the maid Carmen there every day ensured the house remained spotless - she was great. Chef Esteban was amazing, making us breakfast and dinner each day - we didn't eat anywhere else, and have no regrets. Each day, we had fun picking a menu for the following day, and again, the food was spectacular. On a fishing trip that Valerie booked for us, we caught a LOT of fresh yellow-fin tuna, which Esteban turned into two wonderful dinners - what a treat. We also saw thousands of dolphin on the trip and my son landed a 250 pound Blue Marlin. I would highly recommend taking a fishing trip. Finally, Ricky checked in with us every other day, acting as quarterback for our entire trip, ensuring that everything was in order with the house, and that we were getting the most out of Costa Rica. He addressed any issues, any time, and was easily reachable when anything unexpected transpired. Monkeys frolicked around the house, and into the main living area on occasion, and the howler monkeys complimented the bird and insect orchestra. In all, we had an amazing and memorable trip, we would definitely return to Casa Vista Azul, and we would definitely use Escape Villas again. Book with confidence. We appreciate the wonderful review of Vista Azul, one of our premier luxury villas in Manuel Antonio. The entire Escape Villas staff thanks you for the kind words and so glad you enjoyed the villa. You took full advantage of all the activities in our beautiful paradise and we just love that! We hope you visit us again and Pura Vida! Please ask us about lower rates for smaller groups. Property is always private to just your group. Rates include chef service for 2 meals a day, cost of food is additional. Ask us about our meal plans that would include the food and drinks.